The City of Fairmont’s new 5.4 million gallons-per-day water treatment plant (WTP) went online in September after nearly six years of planning, design, and construction. The city’s previous plant was built in 1926 and despite diligent maintenance, it was facing significant challenges related to deteriorating equipment and structures, treatment capacity limitations, seasonal treatment issues, and projected treatment deficiencies with regard to anticipated future drinking water regulations. 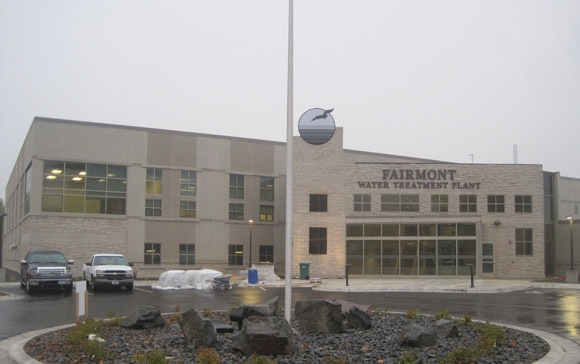 Fairmont city leaders’ goals for the new plant were to eliminate taste and odor complaints due to seasonal changes in Budd Lake, the source of the city’s drinking water, and to provide the most responsible long-term improvements for the city’s aging water treatment infrastructure. The plant currently serves a population of nearly 11,000 people, as well as 476 commercial and 17 industrial customers. 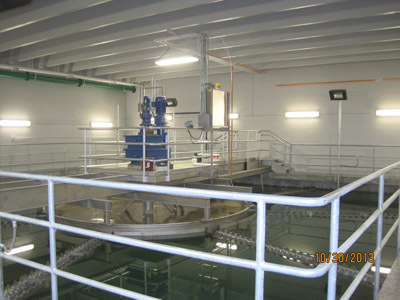 In the summer of 2008, the city teamed with Advanced Engineering and Environmental Services, Inc. (AE2S) of Maple Grove, Minnesota, began working together on a facility planning effort targeted at developing a feasible solution to the compounding challenges at the WTP. The study included projecting treatment and capacity needs and evaluating source water supply alternatives. The city also placed a high priority on evaluating the potential for rehabilitation of the existing facility and reuse of in-place treatment infrastructure. Based on the completion of a multi-disciplinary facility condition assessment, it was determined that extensive rehabilitation of the facility would be required to keep the existing WTP in service for the foreseeable future. In addition, the WTP would still require advanced treatment technologies to be installed to address anticipated future regulations and seasonal taste and odor issues. In the end, Fairmont decision-makers concluded that construction of a new WTP would be the best option from both financial and long-term sustainability perspectives. A complete Supervisory Control and Data Acquisition (SCADA) System. Although much of the new plant was constructed on a site across the street from the original plant, the city was able to reuse much of the existing raw water intake station on the shore of Budd Lake. The existing raw water intake station was rehabilitated and returned to service for the city. In addition to the more conventional lime/soda ash softening and filtration treatment processes, the addition of the granular activated carbon (GAC) adsorption technology will provide for taste and odor control from seasonal variations in raw water quality. GAC is a superior treatment technology for taste and odor constituents, and is recognized by the United States Environmental Protection Agency as a “best available technology” for the treatment of many of the source water compounds which may become regulated over the life of the WTP. “Over the past 80 years, the City of Fairmont had maximized the useful-life of its previous water treatment plant. The new plant provides a strong foundation of lasting infrastructure, robust treatment technologies, enhanced control systems, and the operational flexibility to accommodate future changes in the drinking water industry. The new plant is prepared to serve the city well for the foreseeable future,” says Jason Kosmatka, PE, AE2S project engineer. Although the heart of the plant is already pumping and city customers have been served by the new plant since September, the $31 million water treatment plant project will be officially complete when the city’s former water treatment plant is razed over the winter and the project site is developed into green space on the eastern shore of Budd Lake. Grant Meyer is operations manager with AE2S.Website: www.ae2s.com.